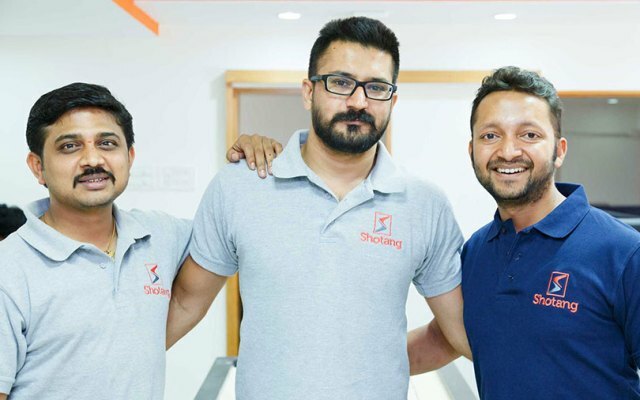 The Shotang founding team (from left to right): Vishal BG, Anterpreet Singh and Anish Basu Roy. Bengaluru-based Sabonka Technologies Pvt Ltd, which runs business-to-business e-commerce platform Shotang, has scaled down its operations, two people close to the development told TechCircle. While the firm had let go most of its employees in December 2017, a few are still working at the firm, the persons mentioned above added. Shotang’s co-founder and chief executive Anish Roy Basu joined fitness app HealthifyMe as senior vice president on Thursday. Though Roy has left the firm, Anterpreet Singh, the other co-founder, is still running the startup, the persons added. Shotang had last raised funds in two tranches between October and December 2017. It secured an additional Rs 5.5 crore ($864,000) from its existing investors, Unitus Impact Livelihoods Fund, which led the round, and Exfinity Partners. The round valued the firm at $40 million post money. The person said that the money was primarily meant to pay off creditors, employee salaries and other business partners and added that the firm tried to pivot itself but failed. The company had raised its Series A round of $5 million (around Rs 33 crore) from Exfinity and Unitus in December 2015. The firm’s founders, Roy and Singh, as well as its investor Exfinity Partners did not respond to messages, emails and phone calls from TechCircle at the time of publishing this report. The company's investor Unitus Impact Livelihoods Fund also couldn’t be immediately reached for a comment. Shotang was founded in 2013 by Roy, Singh and Vishal BG in 2013. It brought together retailers, distributors and manufacturers on a single cloud platform where they could discover, transact and manage their businesses online via an app. The company’s core business comes from connecting consumer brands and their distributors in the mobile handsets and accessories space with standalone retailers. Besides facilitating transactions, the company also involves itself in last-mile delivery and fulfillment. In a recent interaction with VCCircle, Roy had said that with around 18,000 retailers and 35,000 stock keeping units on its platform, the company planned to venture into five new categories and expand its presence to over 84 cities within the next five years. Shotang is not the only B2B e-commerce player to have shut down. In March 2017, Noida-based IndiaMART InterMESH Ltd closed the retail B2B wing of its online business goods marketplace Tolexo. The firm’s founder and CEO Dinesh Agarwal cited flagging sales and underperformance after the government’s demonetisation move as the reasons for the shutdown. In November 2017, VCCircle had reported that Kalaari Capital and SAIF Partners-backed B2B online commerce portal Industrybuying was likely to downsize its workforce. Around 30-50% of its 500-strong workforce was likely to be laid off, and some senior executives in tech, business and sales were also likely to exit the firm amid the churn.